Gifters love to gift; the more impressive the gift, the bigger the box and then the ribbons and the rest of it. There are so many gifting occasions in a year – a horde of festivals, and then Mother’s Day, Father’s Day, and Valentine Week – you name it. We feel obliged to honour each occasion with an appropriate gift, and the gift wrappings accumulate. Ever wondered what your gift recipients do with the wrapping, the boxes and the ribbons? They throw them away. Kilos of gift wrapping ends up in landfills around the world. Is there a way to prevent this? Yes, there is! Gift Wrappings – And More Wrappings! Let us change the way things have been done so far. In honour of Environment Day on June 5th, let’s make a pact to move on to e-gift cards. Let us forget about buying gifts from stores and getting them packaged elaborately. Let us rather turn to an environmentally-friendly, paperless method of gifting wonderful things to the people we love. E-gift cards are quick and easy. All you do is pick an e-gift card this moment, and take a few minutes to personalize it and hit Send. Within the next few seconds, your e-gift card is on its way to your recipient’s email. Job done. Job prettily done, because our e-gift cards come in beautiful templates that fit the gifting occasion perfectly. 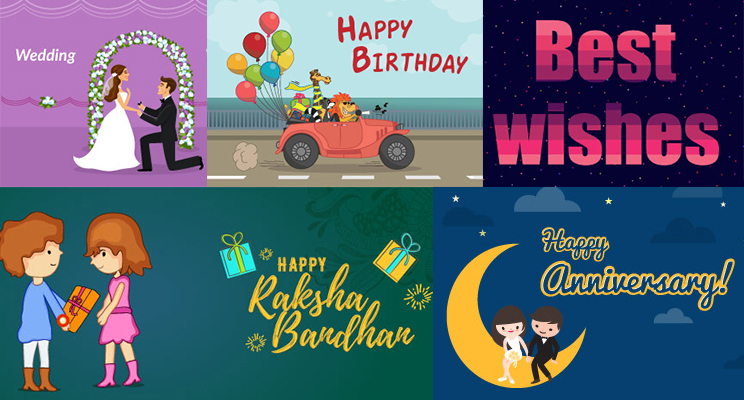 Lovely balloons pop in birthday cards and emotional messages shine through from our Mother’s Day and Father’s Day and Rakhi e-gift cards. You won’t miss anything- except perhaps that tearing sound of the package being unwrapped. Surely you can live without that? So are we in synch? Let’s make our beautiful planet happy by gifting!